T.E.D. 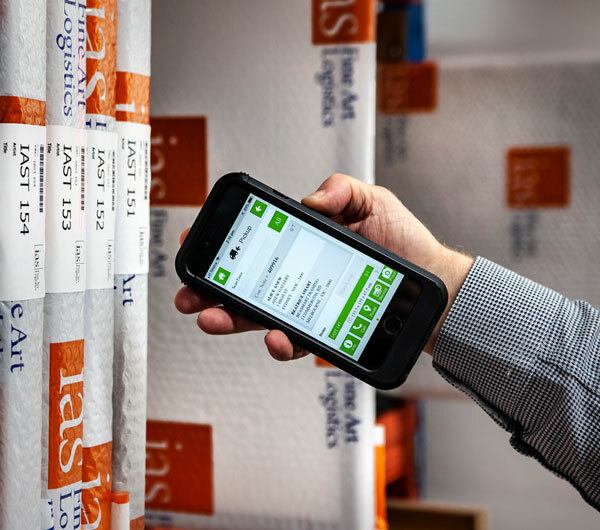 as part of the larger IAS Fine Art Logistics Group is able to provide you with a comprehensive collections’ management service, meaning that at any given time you will be aware of the location, declared value and condition of your entire artwork collection. Whether you are a private collector, corporate entity, public museum or private gallery we are able to tailor a collections management solution to suit your specific needs. Whether your artwork collection is housed at your premises or at one of our museum standard storage facilities, it will be managed by our Art Information Management System (AIMS). Our registrars will catalogue the unique characteristics for each of your artwork pieces such as the name of the artist, title, dimension, accession code, and an image if required. To ensure the accuracy of the inventory management data, we schedule an artwork audit twice a year, to reconcile the AIMS location against the actual location. Comprehensive status reports are available as part of our collection management offering. We are able to obtain a valuation on every artwork of your collection. Having current valuations, enables you to ensure that your asset register and insurance policies are maintained to reflect the current market values. Our registrars will enter the current value of each artwork into AIMS for ongoing reference. Whether it be in your private residence, corporate office or holiday home, our registrars will develop rotation program to coordinate with your special events, celebrations or programmed activities. To refresh the look of your artwork, we are able to arrange for the reframing of an existing piece of artwork or the framing a new acquisition. Framing can be in the form of traditional designs or the latest contemporary styling. Our registrars will consult with you to select a framing design to complement your new or existing décor. We enjoy long standing relationships with Australia’s leading art conservation companies and are able to coordinate conservation works to suit your requirements. If conservation is required, it can be scheduled to occur in conjunction with your art rotation program or as a one off requirement. Our conservation partners are able to conserve your artworks, antiques, artefacts or other objects of cultural or heritage significance. They will assess the condition of existing artworks, and make recommendations for conservation, repair or maintenance, as well as advising on the ongoing care and management of the collection. Art conservation technicians are able to conserve your artworks, antiques, artefacts or other objects of cultural or heritage significance. Art Consultants have unique business relationships with local and overseas artists and are always conversant with upcoming art fairs and exhibitions. Whether you are a private client or corporation in Australia or overseas, they will personalise their service to suit your current, medium and long term requirements.